Long before there was Joan of Arc, Mulan, or even Laura Croft: Tomb Raider there was Judith. Back in biblical times, she saved the Israelites from an imminent attack by the Assyrians – how’d she do it? First, she sweet talks her way into the enemy camp, then gets their general drunk and finally she winds up decapitating the guy. Some pretty graphic stuff. It’s all chronicled in the book of Judith – which although not part of the Hebrew Bible is still considered to be a sacred Jewish text. 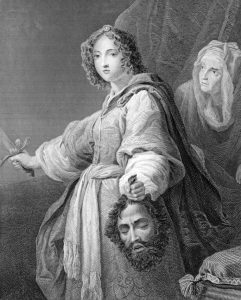 Deborah Levine Gera, the Hebrew University Shalom Horowitz Professor of Classics, wrote a new translation of the Book of Judith which includes a verse by verse commentary. It contains all the gory details but also new insight into Judith as a feminist figure.